I would be nothing without my amazing clients, forever trusting me with their memories. They said some pretty nice things about their experience with Swept Away Photo, I hope you’ll have a read. Selecting a photographer is one of the most important decisions you make when planning your wedding. You want someone who is highly-skilled, personable, patient, kind, and relaxed. Caity embodies all of these qualities and her work is phenomenal. Working with Caity was a true delight, from our initial meeting, to the engagement photos, and of course, the big day itself! Caity truly went above and beyond to put our minds at ease and get to know us, making us feel comfortable in front of the camera. We had so much fun working with Caity! 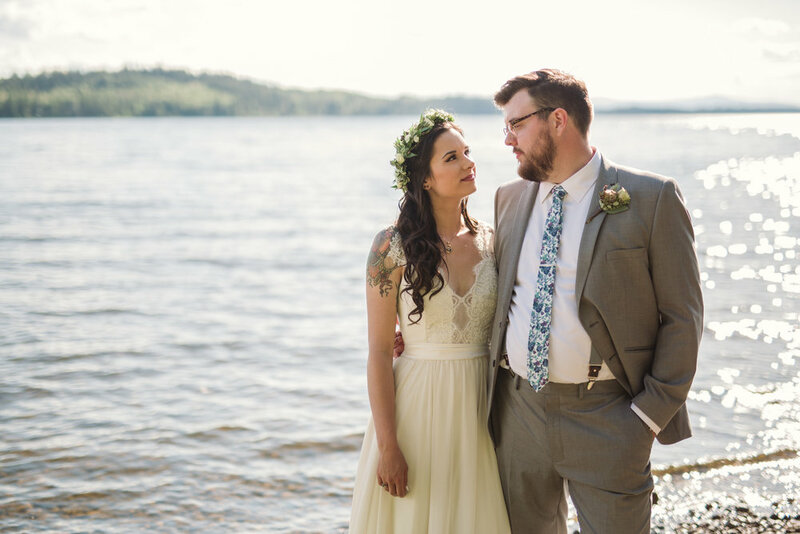 Caity captured our wedding day beautifully, providing us with a mixture of stunning portraits, classic ceremony images, and organic/candid moments with friends and family. There are no words to describe the excitement we felt when we received our final images in the mail. Caity packaged everything so beautifully; every detail was perfect! Looking at the photos brings back all of the feelings from the big day, including little moments that we thought nobody else saw. We love the romantic, airy, and organic feel of Caity's photos. There is also an element of fun and whimsy that is so special. We know these images will stand the test of time; they are photographs we will be proud to have on our walls for the next 10, 20, 30, etc. years. "The most important thing for my husband and myself was to have a photographer that we got along with, one that we would be able to spend the majority of the most important day of our lives with and not even mind. Caity is exactly that person and then some. We not only got along with her - we ended up wishing she could join us for the celebrations afterwards! From our first phone call she was a delight - very easy to talk to but also incredibly helpful when it came to suggestions such as timeline and order of events for the day. On the day of she did a phenomenal job of using the limited time to create a swath of photos that make it seem like she was in several places at once. Her photos captured so much of the joy and love of our wedding day that they have been a pleasure to look over again and again and again. We will cherish her photos forever, and could not recommend her enough as a hardworking and personable photographer. Also if it is going to rain on your wedding day - you have never seen someone who has mastered the umbrella-camera technique quite like Caity! Our wedding day was an event we had planned for years, and something both our families were eager for; it was the first and last for both sides, as we are both only children. To be able to capture this once in a lifetime event in photos that also express our personalities was something Caity did with apparent ease and a wonderful sense of humour (one of our favourites is a candid at the reception of the bouquet toss!). On the day, Caity provided deft direction to our wedding party, family members, and second shooter, which was crucial in allowing us to capture the many moments of our wedding that we will look back on for years. We love Caity, and loved having her chronicle the beginning of our journey together as husband and wife. When it came to picking a photographer for our wedding day, we wanted someone who we could feel comfortable and relaxed with, and someone who could capture not only the beauty of one of our favorite locations, but also the emotions of the day. For us it was an easy choice, and we knew Caity could provide all of what we were looking for, including beautiful images. On the day of our wedding, Caity didn’t feel like our wedding photographer, she felt like an old friend who was joining in on our celebration and was just conveniently taking pictures. We're so grateful for this because it is so well reflected in the photos we got back. Every time we revisit our wedding photos we feel like we are reliving the genuine happiness, love and laughs of the day. From the little details to the big moments, Caity captured it all and we are so grateful we have such a comprehensive and beautiful recount of one of the best days. Caity is truly a pro at her craft and I couldn't imagine what our day would have been like without her easy going and extremely accommodating personality and impressive work ethic, not to mention, the girl can boogie on the dance floor!